De Colores: The Raza Experience in Books for Children: One Minute Mysteries: More Short Mysteries You Solve with Science! / Misterios de un minuto: ¡Más misterios cortos que resuelves con ciencias! One Minute Mysteries: More Short Mysteries You Solve with Science! / Misterios de un minuto: ¡Más misterios cortos que resuelves con ciencias! This fourth in the One Minute Mysteries series, and the first in both Spanish and English, contains most of the short mysteries found in the previous three English editions. The project began, as the foreword describes, as a series of father-and-daughter activities in which Eric wrote, Natalie rolled her eyes, Natalie wrote, and the two wrote side by side. Eric’s vision was “to emphasize (science’s) widespread, real-life applications,” and Natalie’s was “to (keep) the behavior and dialogue of the characters authentic.” Natalie writes that their technique involved, in part, “(staring) at a dead spider on the ceiling above my dad’s desk for hours and hours.” This approach apparently worked—very well. For youngsters, these challenging problems open up both discoveries and potential for curious, inquisitive minds. 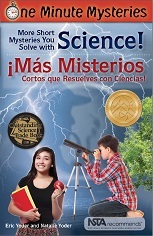 And that these 45 pint-sized “mysteries”—covering Life Science, Earth and Space Science, Physical and Chemical Science, General Science, and including a Mathematics Bonus Section—are both encountered and solved by children themselves make this volume both fun and accessible. The book design is clear and the text is readable, without illustrations or clues to detract from each “mystery.” The problems are presented in English on the left and Spanish on the right and generally headed by puns in each language to grab attention. The images—black-and-white photos and drawings—are appropriately reserved for the “solution” pages: those on each two-page spread are related to each other so young readers can intuit more than one connection between image and solution. While it’s obvious that the authors used great care in choosing the photos of both children and adults who represent a diversity of age, ethnicity and gender, I would like to have seen representation of children and adults with disabilities and the spectrum of family configurations as well. Bachelet’s colloquial Spanish translation reads well, and this layout of the mysteries and solutions enable English-speakers, hablantes, and bilingual students to work in the language in which they’re most proficient, and look to the other side for corresponding words, phrases, and particular idioms that interest them. Engaging and fun for both science- and math nerds (and their parents, if permitted), as well as youngsters who could benefit from some time away from video games, One Minute Mysteries: More Short Mysteries You Solve with Science! / ¡Más misterios cortos que resuelves con ciencias! is highly recommended.